Scandal-plagued Goldman Sachs has sunk deep into a bear market. Losses accelerated this month following allegations of financial misdeeds regarding the Malaysian government investment fund 1MDB. Regulatory uncertainty surrounding the scandal prompted Morgan Stanley to downgrade its rating to equal weight. Its stock has dropped 14 percent in November, putting it on track for its worst monthly performance since May 2012. 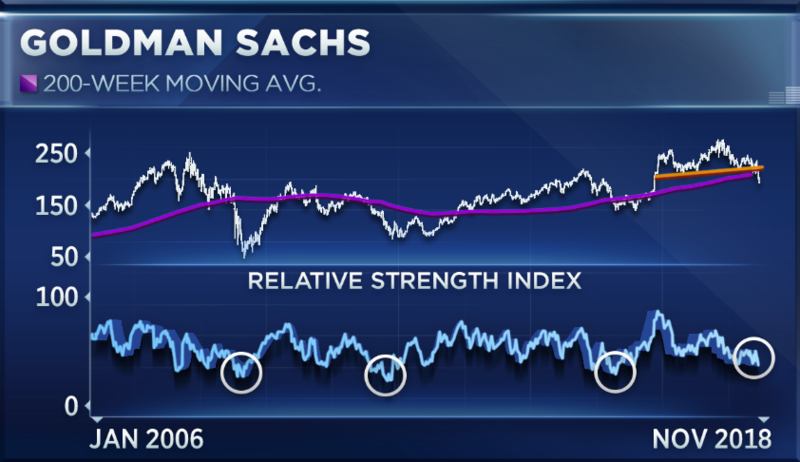 "A lot of technical damage has been done to this name," Matt Maley, equity strategist at Miller Tabak, told CNBC's "Trading Nation" on Tuesday. "It's broken below its 200-week moving average. It's also broken below the neckline of a head and shoulders pattern, so that's negative." Those technical red flags suggest to Maley that the worst is not yet over for Goldman Sachs. The stock had already broken below its shorter-term 50-day moving average at the beginning of the month. "Also, even though its daily RSI is oversold, its weekly RSI is not as oversold as it has been at other important bottoms for the stock," added Maley. "I wouldn't sell it here, but any kind of a rally you might want to look at some other names like Bank of America, whose chart looks much better," said Maley. Bank of America has also come under pressure this year, but not as badly as Goldman. Bank of America shares are down 6 percent for 2018, while Goldman has fallen 24 percent. Michael Bapis, managing director with Vios Advisors at Rockefeller Capital Management, says Goldman's sharp downturn presents a buying opportunity. "I think Goldman Sachs, the damage is done. They're trading at seven times next year's earnings," Bapis said on "Trading Nation" on Tuesday. "They always trade at a premium. They'll get back to that premium." Goldman began the year trading at a more elevated 12 times forward earnings, but now trades below an 8 times multiple. By comparison, the XLF financial ETF trades at 11 times forward earnings. "There's been change-over in management, there's been a little bit of a scandal, but I still think they have the best and most attractive product set to drive growth going forward in the next 12 to 18 months," said Bapis.